Rise Currency and Applications Everywhere. Our number one goal is to make Rise accessible to everybody. This means we're putting massive effort into making our web interface scale across all devices. By keeping within cryptocurrency core values, you'll be able to transfer value, build applications, trade and even invest via an easy to use and decentralized UI. We want to change the way you handle your money, and your wealth. The total coin supply is 100 milllion. • 1 million for pre-ICO bounties. • 2 million for post-ICO bounties as well as strategical partners and backers. • 9 million to be withheld by the development team. We are a group of highly talented enthuiasts, but we don't know everything . We will be building a foundation, post ICO, to get the community involved. Voting on features we need, and where the foundation will go from the initial launch will be the job of the community. We are working to bridge the gap between physical and virtual. RISE is our first step towards this goal. Ultimately, we want you to be able to pay for both Digital and Physical goods with RISE, as if it were your country's FIAT. currently under development, short-term and long-term vision for Rise and future applications. setup they use on a daily basis to build the RISE platform. Stay tuned. .
Get briefed in the Rise War Room! We’ll be releasing a blog post giving detailed insight into the Developer’s screen setups, frameworks and tools used daily for developing the RISE platform. Those who have watched the video we released last week may have noticed a revealing of a few new specifications for RISE 2.0 (the new code base currently under development). We already discussed the maximum TPS last week. Today I’d like to highlight another aspect that was mentioned in the video namely the changes on the cryptography side of things.Lisk uses SHA-256, which is a 256-bit version of SHA-2. Instead of staying with SHA-2, we are jumping to the current NIST standard instead. There isn’t anything technically “wrong” with SHA-2, other than that it is designed very similarly to SHA-1, which is susceptible to numerous technical flaws. SHA-2 doesn’t appear to be susceptible to the same flaws, however, much research over the past 10 years has been devoted to building SHA-3, instead of proofing SHA-2, so its holes may just not be known.So the benefit for RISE to go with SHA-3 is a potentially more secure platform. Another advantage of SHA-3 is that the message size is unlimited as compared to the 2^64 - 1 bits in SHA-2. Ofcourse 2^64 -1 bits is a LOT of data but there are scenarios in which this may be exceeded on our platform and where SHA-3’s unlimited message size could become a benefit. Our developers are still busy engineering parts of the Rise architecture so I can’t give much more on the specifics of this for now, but I’ll continue to update you as development is moving forward. We use quite a few tools on a daily basis, some shared, some not. A few other tools we use, but have varied applications for, is Terminal (I use iTerm with ZSH, Nathan uses Terminal with ZSH, and Richard used Terminal with BASH.) Nathan and I predominately stick with git on the command line, while Richard uses the Github GUI. I also tend to live in Mail on my Mac, while Richard and Nathan use Gmail in Chrome. Depending on the code in use, I also use a few more advanced debugging and editing tools for code, like Intellij IDE, and Meteor Toys. For browsers, I live in Safari, while both Richard and Nathan use Chrome (Although I have been seriously contemplating switching to Chrome). 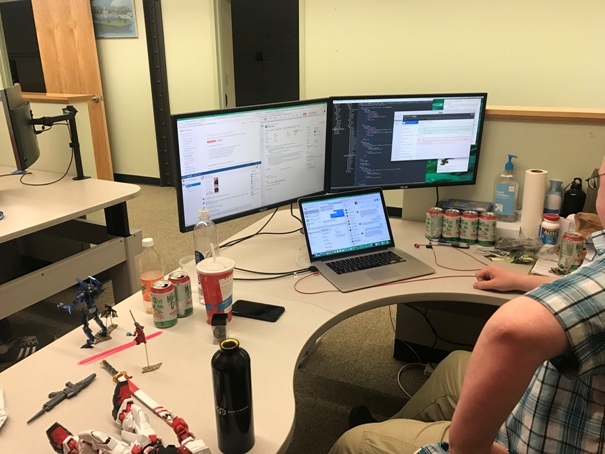 For Static site editing, I use C9.io, connected to Github directly so I can work collaboratively on code with my marketing team. We three all have MacBook Pros connected to external displays. I have 3 27" displays, 2 connected in Portrait, and 1 in landscape, and I use an external wireless keyboard and trackpad. 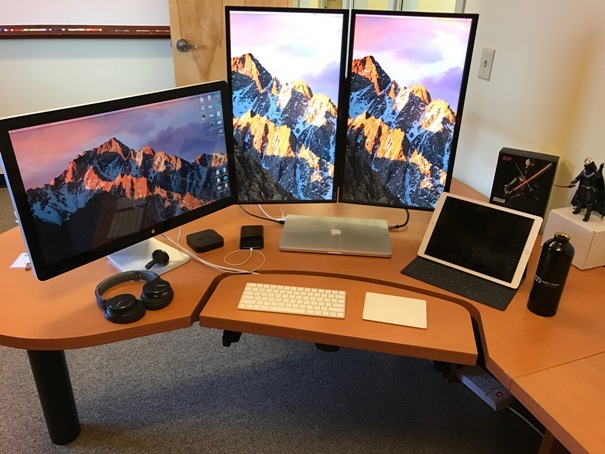 Richard has 2 27" displays, connected in landscape, and uses the laptop screen, keyboard and trackpad. Nathan uses a 34" Ultrawide by LG, and his laptop screen, keyboard and trackpad. Most of the architecture for Rise 2.0 is now completed. The team is still working on Side-chains and are then going to break down the architecture into specified user stories that they will push over to Github. At that point you will have a fairly accurate way to track progress on the new code base. There is a basic Proof of Concept nearing completion, the team is working on the peering functions now and once that is complete they will be running some testing on speed to get a real-world measurement of what the network can handle. More updates coming soon. Stay tuned. And it’s time for the promised update. The dev team has begun to translate the completed Rise 2.0 architecture into user stories. This process is ongoing. Justin and Richard are writing the user stories and Nathan is working on turning these into code. What exactly is a user story? They typically follow a simple template: As a <type of user>, I want <some goal> so that <some reason>. The Rise Dev Team pushes each user story to Github so the community can look over their shoulders and follow exactly what is being worked on. We have a fairly big announcement. We are in the process of restoring investor confidence and part of that process is to reward our current Rise token holders, as well as getting delegates forging as soon as possible. Even though we are currently on this path, it’s only fair to mention that we had hit a bumpy road. Previously, we have been pulling teeth, trying to get updates from our development team. It had gotten to a point where we were instructed to formulate emails as the “method” to reach them. Days had turned into weeks and even after many promises of daily updates, we still didn’t see progress. Many of you guys had stressed your concern as well. We were then told by Justin that his development team needed more funds to continue the project. After close examination, and to prevent our funds from becoming more depleted with little to show for it, we discontinued funds to Don’t Panic (Justin’s business). As a result, Don’t Panic including our co-founder Justin walked away from the project. However, we have acted quickly and are working with another developer right now. We will let everyone know who this is in an upcoming announcement. All Rise 2.0 work so far has been transferred to our new developer. Before we move further on that, we have decided that we will push out Rise Classic by cloning Lisk to get delegates forging and earning rewards ASAP. 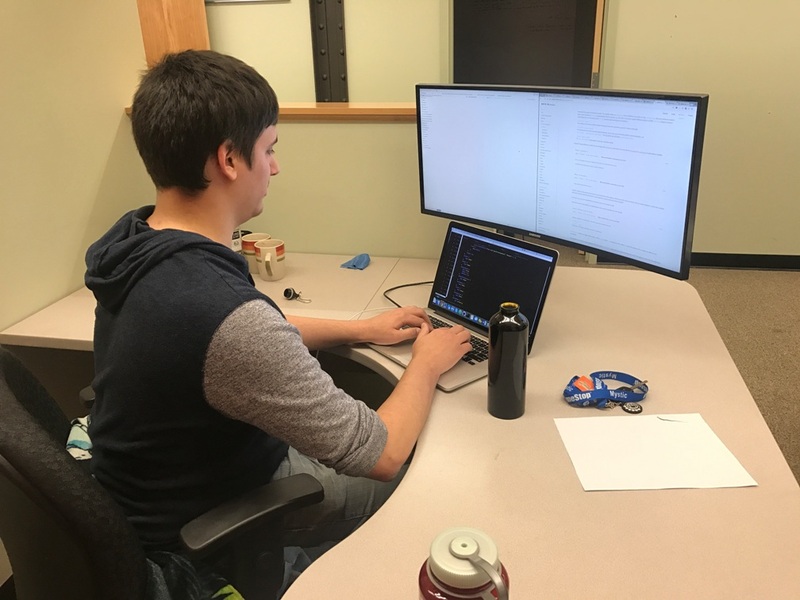 We had relied on Justin’s promises that Rise 2.0 code base was going to be “easy enough” for him and we counted on his insight, such as promising a working prototype by December. It was moved to January, and then to February. And nothing came to fruition. “More funds” was never part of our original agreement with him. So we have decided to move quickly and get Lisk cloned and delegates forging (Rise Classic) while Rise 2.0 is looked at by our hired new developers. We don’t want to waste any more time on this. In addition, we will be rewarding our token holders by providing them with Chipz which is explained below. We are in negotiations with an online casino software supplier with the aim to launch a fully operational online gaming platform that will operate using Chipz tokens as the currency. Rise holders will receive Chipz tokens based on their holdings. The value of Chipz will be determined by the free market as soon as it hits an exchange. In order to use the casino players will be required to purchase Chipz tokens… Chipz will be available for purchase direct from the casino converted at the current market price or from an exchange. As soon as fiat gateways are available on the Waves network the casino will begin accepting fiat tokens that can be used to instantly purchase chipz for use in the casino. 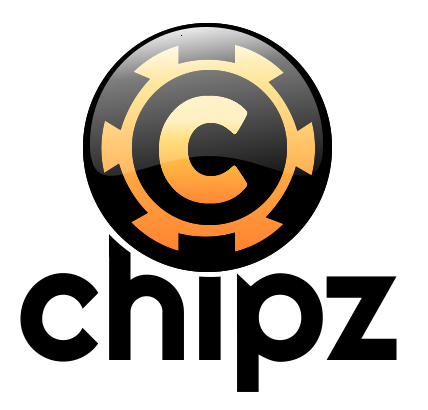 More details to be revealed as we advance the Chipz project. McVenture and myself will check in regularly this week here at the forums to make sure we answer any questions you guys have. Thanks. And let’s get this project rockin’. Good things to come! This last week has been very eventful for Rise and has left some people uncertain about the status. This post brings all the details together that were released spread out over a myriad of posts. Justin (co-founder and lead developer of Rise) is no longer working on the Rise 2.0 platform, including his employees Nathan and Richard. The Rise team was dissatisfied with the lack of progress and denied Justin’s demand for more funds to continue developing. Rise 2.0 is not off the table, The ICO promise of adding multi-code language support and easy-to-use tools for buildings dapps will still be pursued. Rise development funds were temporarily moved to Bittrex. The account was frozen by Bittrex as this is their standard security mechanism. The account is being verified in the next few days to be unfrozen and the funds will be moved to a permanent Rise wallet address for everyone to see. The Rise address will be announced here. Rise team is working to reward Rise holders through the Chipz Project. Chipz was announced earlier this week and is in the beginning stages. Rise holders will be the beneficiaries of the Chipz airdrop. More details will be shared as it becomes available. In a few days from now we will announce a competition for loyal Rise supporters with a total prize pot of 1 Million Rise. Stay tuned. The new Rise mainnet is estimated to go live tentatively within the next few weeks, so it’s time to go over a quick list of things that are planned for this launch so far. More details for each listed item will follow as we’re drawing nearer to the time of launch. The launch facilitates the transition Rise is making from Lisk to Ark code base. Most coins forged by Rise Team will be burned, which will help Rise value. Public Delegates will take over forging of Rise to secure the blockchain and earn rewards. As we are at the end of March, it is time to recap activities the team have been involved in this month. We hope this allows you to catch up with the progress we have made. We are very excited to share we are preparing for our core mainnet release of the rewritten and tested TypeScript code base in April. The magnitude of this milestone should be celebrated and is a culmination of months of hard work by the Development team. Further announcements will be made in due course to inform and showcase this achievement in RISE development. As we prepare for the imminent release of our new TypeScript core to mainnet there will be some tasks if you run a node. 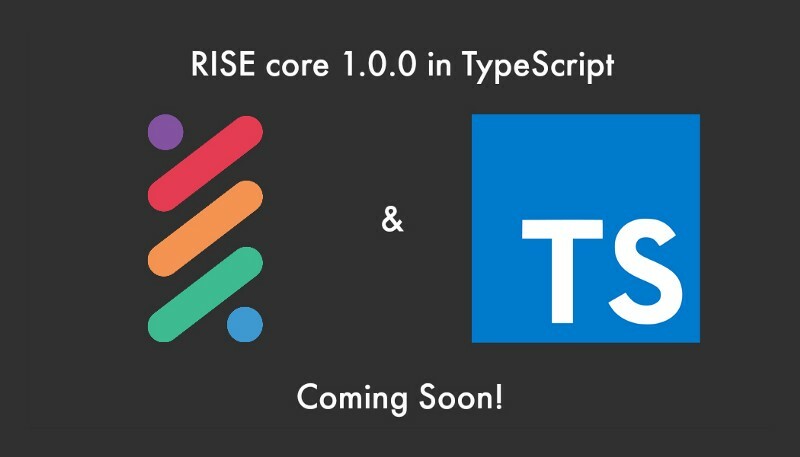 Please update your nodes via `./rise_manager.bash update_client` as this update is mandatory for the upcoming TypeScript core release and further instructions may be requested in the #delegates channel in Slack. We released a new version of the RISE desktop wallet as users mentioned they were having issues with this. 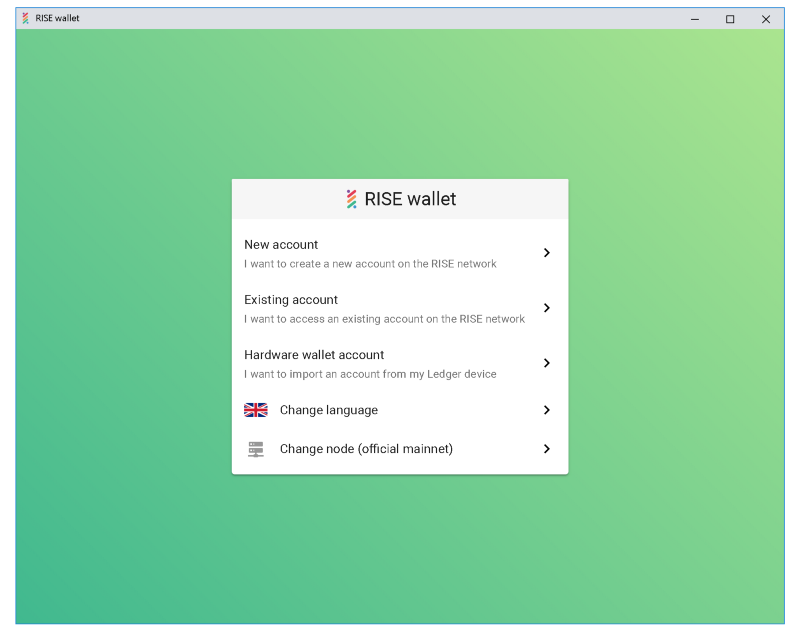 If you use the desktop wallet please update it, you can find the new release here: https://github.com/RiseVision/rise-desktop/releases. If you use a Mac, please bear with us and use the web wallet for the time being. Thank you for your patience. A big thank you to the testers who completed the TypeScript testing program launched in January for running testnet nodes successfully and supporting our development team. We are currently arranging bounties for your dedication to the progress of RISE development. 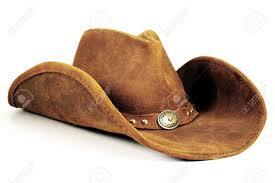 Please look out for further bounties which will be publicised on our new website. We understand how anxious everyone is with regards to working with exchanges. As discussed previously, we need to maintain a balance with discussing listing conversations to ensure we do not jeopardise any partnerships. We have engaged multiple exchanges that we believe would be a good fit for RISE. Without going into each individual process, we can say there are a multitude of requirements to be considered, they can include listing fees, legal documents, volume and ERC20/non-ERC20 integrations. We will conclude this with mentioning that RISE is in a very unique position, being a non-ERC20 with low volume in the current climate is lengthening discussions. We will keep working hard on this and we hope to share more progress soon. 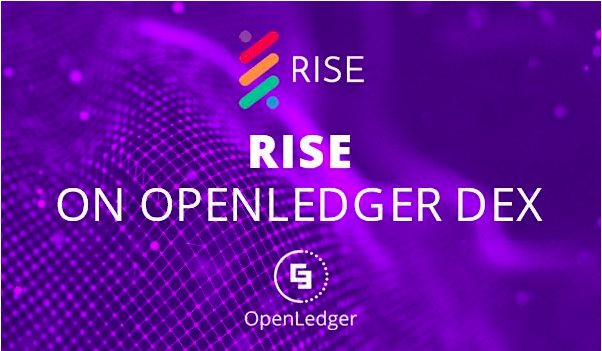 In the meantime, check out this awesome blog post by our friends at OpenLedger DEX, a peer to peer platform based on Bitshares technology: https://steemit.com/openledger/@bloggersclub/rise-traded-on-openledger-dex. This month they opened the gateway for RISE. You can also follow them on Twitter at @OpenLedgerDC. As discussed previously, it is imperative that RISE can attract great development and commercial talent for our continued growth. Therefore, I am delighted to say we have a new developer to add to the team, a further announcement on this hire will be shared in the first half of April. We are also expanding our community team, we will announce these community managers shortly after their their appointment is confirmed. In March a considerable amount of time was spent working with our partnered creative design team on fine tuning the new website. 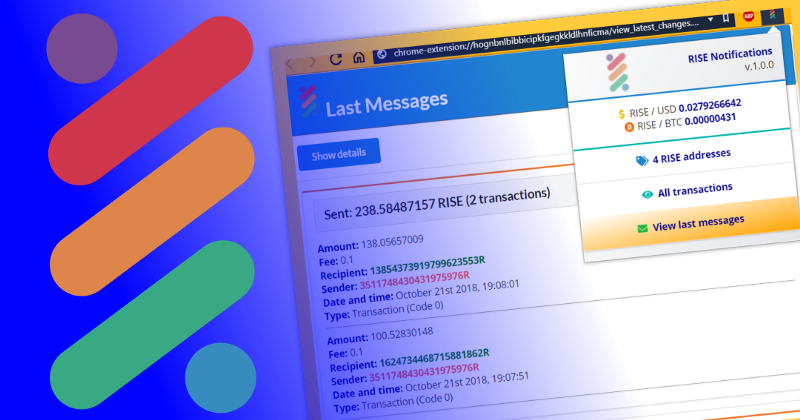 The concept behind the redesign was to drive a more focused, concise message on the mission of RISE and how developers would engage with the project. This rationale led us to recreate and reorganise content for the website. We want our new website to be an open invitation for developers to access our developer tools and learn about the RISE DPOS blockchain. Many community members have asked for an ‘Asked Me Anything’. We aim for release of our mainnet and website first, after these milestones we will communicate the official process for our AMA for April, likely a subreddit. We look forward to answering your questions and gleaning feedback from dedicated community members. 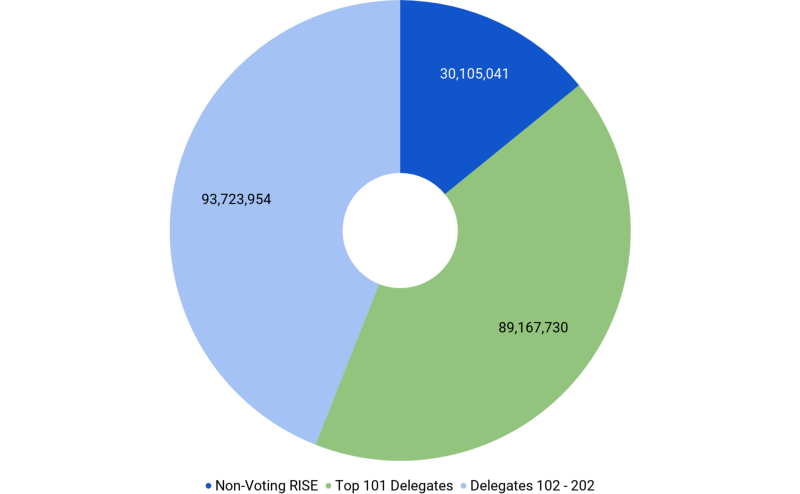 The below chart highlights the number and percentage of RISE voted to elect the 101 Delegates and the 102-202 nodes securing the network and non-voting RISE. Total RISE Supply 122,542,070. Chart generated 31st March 2018. To close on this month, we thank our great community for their patience and encouragement during this time. We are all working hard every day to progress the vision of RISE. Make sure you follow us on Facebook, Twitter, Reddit and Linkedin for latest news. Disclaimer: RISE is not a security, and token holders are not investors. There is no guarantee you will make any money from holding RISE tokens, and you do not own any part of RISE VISION PLC or any entity as a result of owning RISE tokens. As we are at the end of April, it is time to recap activities the team have been involved in this month. We hope this allows you to catch up with the milestones we have reached this month. 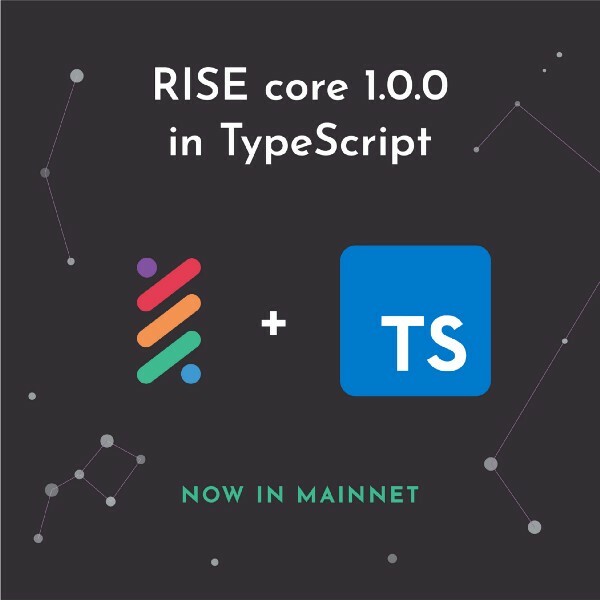 It has been a very notable month for the RISE development team, as we have released the RISE TypeScript Core 1.0.0 to mainnet. You can read more about the RISE journey to mainnet in this post here: RISE Core 1.0.0 Meets Mainnet. We invite everyone to download the new RISE core and help us continuously improve. Instructions are available in our Github repository. This milestone was picked up by various online outlets. You can read the Press Release here on CryptoNinjas and Coinatory. You will also be able to retweet mentions from XBTMoney, CryptoNewswire and BitcoinsGuide. We have already created GitHub projects that will be regularly updated with the issues and tasks we would like to implement for each new version. Improving our unit tests. Two key tasks were to increase coveralls, reviewing and improving the quality of the unit tests done. Unit testing involves subjecting each piece of code to a series of tests, after every change to the source code. The more often we run unit tests, the better as we can identify if there are any bugs or issues. The code base has been checked with a static analysis tool (SonarTS) and several recommendations have been implemented. Improving efficiency between node communications through enhanced Peers Logic by making sure that an invalid/lagging node is not constantly added and removed to the list. This should improve performance and reduce useless log entries. We have migrated the codebase to support a newer version of NodeJS (version 8) compared to the previous version we were using (version 6). As well as, rewriting the whole database layer using a more robust JS library. This will bring us more efficiency. We are working on new and improved RISE wallets. Finally, Andrea has been working on the integration for RISE support on the Ledger Nano. We need your help to vote for RISE on the Ledger roadmap. For reference, you will need a Trello account to comment and vote. In April RISE was listed on OctaEx (Octal Bit Exchanger), a new Chinese cryptocurrency exchange, which is quickly gaining popularity. In addition to English, OctaEx available in Thai, Mandarin and Cantonese. As also stated previously, RISE will be listed on Exrates.me. Due to listing policy we do not know the exact date, Exrates will announce when RISE is listed. To repeat from our last article, we have engaged multiple exchanges that we believe would be a good fit for RISE. Without going into each individual process, we can say there are a multitude of requirements to be considered, they can include listing fees, legal documents, volume and ERC20/non-ERC20 integrations. We will conclude this with mentioning that RISE is in a very unique position, being a non-ERC20 with low volume in the current climate is lengthening discussions. We will keep working hard on negotiating the best deals for RISE. In the meantime, you can check the Exchanges page on the RISE website for where RISE is available. The RISE team would like to officially welcome two new members to the project. Firstly, Mart has joined the team this month, he is a polyglot developer, with over 15 years of experience crafting web, desktop, mobile applications and backend software. Mart will be creating new RISE wallets that will be user-friendly and easy to maintain going forward. Secondly, Rajesh has also joined the team as a Community Manager, with experience in managing crypto communities for over 20 ICO’s to date. He is also a programmer interested in adapting blockchain technology. RISE is actively seeking new recruits to further development, please check out our Careers page and we are offering a referral bounty for talented developers. Everyone can help us on our mission to develop an ecosystem for developers to build DAPPs, so please get in touch. You can contact us for suggestions, referrals and speculative applications via our website. The new and improved RISE website was officially launched in April. You can read more about the design here: Welcome to the new RISE website. Please explore and share the site as we aim to keep this well maintained and updated. We have introduced Google Analytics, which will help us make more informed decisions on how to engage with our marketing channels going forward. A whitepaper is something nearly all projects must have before they start development. Our initial thinking was to completely rewrite the whitepaper, however, we believe it will be more beneficial to create a ‘Litepaper’. This will build on the initial whitepaper written in 2016, but cover more deeply the problems RISE is addressing today and how RISE can solve these problems in the future. 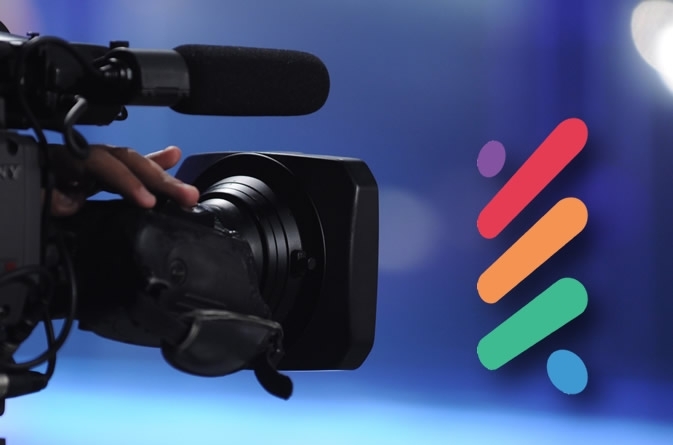 We will include progress on development and features of the platform that will allow our audience to contextualise the entire project from a business/commercial viewpoint. We wanted as many people as possible to participate in the Q&A without having to create an account on a specific social media platform, therefore,we have decided to simplify this with a Google form. You will be able to submit multiple times if you have more than 3 questions. This form will be open for questions until Thursday 3rd May 11pm GMT. We intend to publish all questions submitted the following week with answers depending on the volume of submissions. 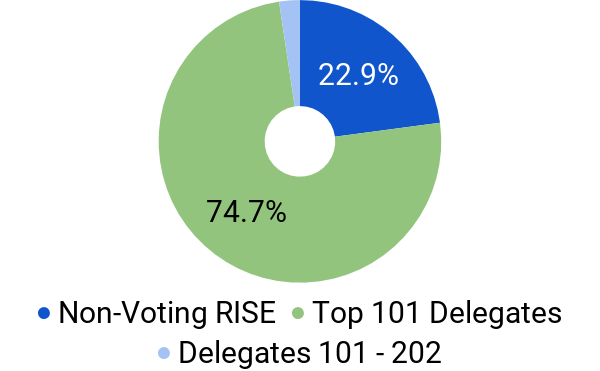 The below chart highlights the number and percentage of RISE voted to elect the 101 Delegates and the 102–202 nodes securing the network and non-voting RISE. To close on this month, we thank the community for promoting RISE and we hope to give you more great news as we progress the vision of RISE. RISE Vision PLC (token symbol RISE) is an ecosystem for developers, offering a platform for the development of decentralised applications powered by a community driven Delegated Proof of Stake (DPoS) blockchain. Thank you to the community members who submitted questions to us last week. Outlined below are all questions asked and their respective answers at present. If these answers develop or change we will aim to inform the community through future updates. There is no value in announcing a partnership for ‘hype’ if it is not mutually beneficial or strategically aligned with RISE. We wanted to focus on building technology first and gaining progress on these key milestones, some of which have been achieved, as RISE is now in mainnet. Our next phase will be to grow relationships with developers. As such we have begun very initial discussions with coding academies and universities in Europe. 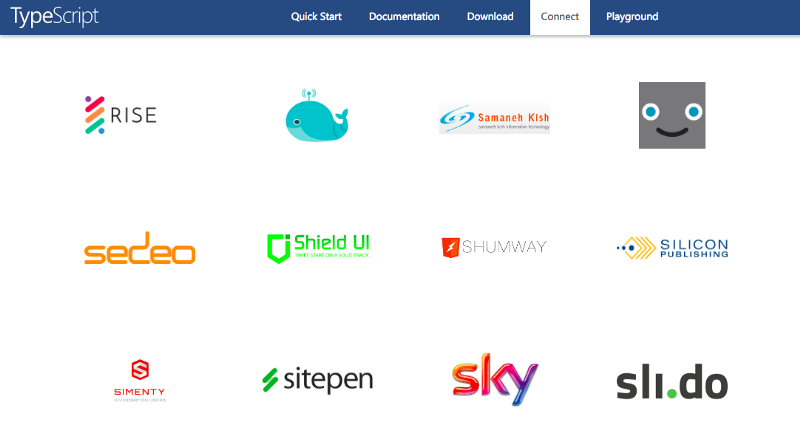 We are open to partnerships globally, so if you are reading this and have a great contact within a developer community or educational institution, fill out this form. This month we are creating a RISE overview one-pager, a pitch deck for partnership meetings/meetups and the ‘Litepaper’. Yes, we aim to create tutorials/guides to help developers understand how to build on RISE once we are able to offer a more complete solution. Furthermore, we aim to ensure that our Github has easy instructions to follow in the ‘wiki’ section for developers of all levels to use. We are also able to give bounties for anyone who contributes to building applications, tutorials and technical documentation for RISE. As a starting point, you can create applications with the RISE APIs in Github and this will allow you to interact with the RISE blockchain. Any application created today, helps us to stress test the network and improve the RISE technology. Below are some examples of applications created using the APIs by developers in the RISE community. We hope that there will be more in the future as more developers learn about RISE. Examples of API applications: Telegram DPoSBOT, Google Ticker, Slack RISEBot and DPOS Tools. As an example, let us explore our thinking behind Interlet which was a DAPP idea for the vacation rentals market. The problem today is there are high fees for hosts and guest, as well as issues around currency transactions rates on existing centralised platforms. As a solution, the DAPP running on the RISE blockchain would have allowed for lower fees through the facilitation of peer to peer transactions with cryptocurrency as payment. The beauty of DAPPs is that there are huge opportunities for developers to create the next ‘killer app’ and we aim to ensure RISE technology enables this. Delegated Proof Of Stake — Through offering all RISE holders a opportunity to vote and partake in securing the network, this is one of the more decentralised blockchains available. We also believe that the RISE combination of 101 Delegates/block producers and 1 vote per wallet, makes RISE a unique blockchain. No other DPOS project has this exact protocol. Since the rewrite of the core, RISE is experimenting with transactions per second and we will publicly share this when our development team are happy with how far this has been pushed. Typescript Code base — Internally, TypeScript helps RISE to develop quicker with less bugs and write more intuitive, maintainable code. Externally, Typescript offers reliable and readable code for developers to understand how the core has been created. Developer Tools — APIs and TypeScript SDK — Through offering a range of programming languages to interact with the RISE blockchain we believe this enables more developers to learn about blockchain. At present the more developers that can understand blockchain helps the entire industry to grow. Sidechains — RISE aims to develop sidechain technology to allow developers and businesses to build distributed applications with token assets on RISE in the future. Each sidechain will link to the RISE mainchain. In theory this will enable communication between chains to execute different functions ultimately enhancing scalability of the RISE blockchain. This is scheduled for development later this year, however, completion is highly dependent on working with a cryptographer who understands blockchain technology. Dynamic Fees — Dynamic fees will aim to detect changes in network volume and will raise or lower transaction fees accordingly. The combination of these 5 elements makes RISE a unique solution for developers to build DAPPs upon. Currently, there are APIs that can be used to create applications in Github. Following on from this there is a process of features that need to be built as part of a scalable platform for DAPPs to then be built upon. For example, dynamic fees and scalable enhancements need to be developed and released before sidechains and an SDK. These are larger milestones planned for this year, however it will depend on resources, testing and refinements which are not always easy to give an exact timeframe of completion. In the meantime, we recommend following Github projects for RISE development. RISE essentially aims to focus on offering tools for developers to learn and create applications on the RISE blockchain in multiple programming languages. Furthermore, from a blockchain protocol level no other project has the same network specifications as RISE: 1 vote per wallet and 101 Delegates/block producers. 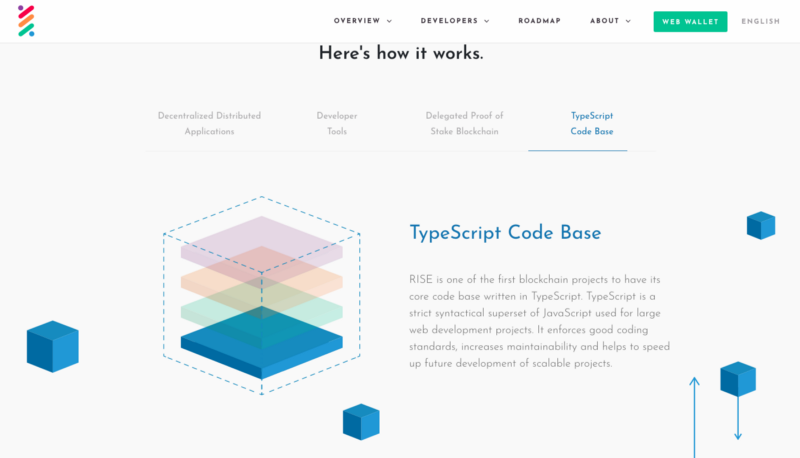 A combination of the RISE DPOS blockchain, a TypeScript code base and developer tools in multiple programming languages makes RISE advantageous for developers to explore the RISE platform. We would like to add RISE is a strong advocate of Delegated Proof of Stake as a blockchain protocol. Therefore, for the progression of the DPOS ecosystem we wish all projects using DPOS to be successful and where strategically aligned the opportunity to partner together. 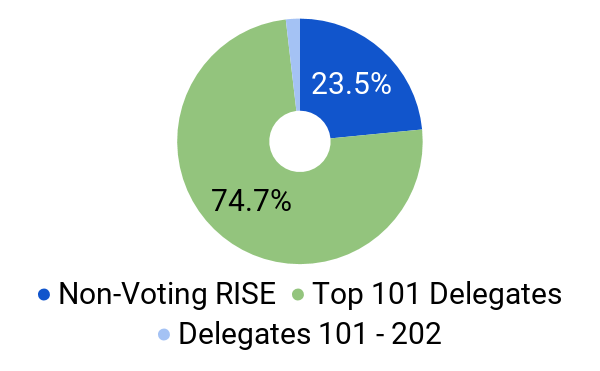 RISE blockchain has 101 Delegates/block producers and allows the community 1 vote per wallet equalling number of RISE held in wallet. What is your strategy for exchanges? Initially, we wanted to diversify across a range of exchanges that were logical to pay for with regards to volume and regional exposure. As a result today RISE is now on Openledger, Octaex, Godex and Exrates. Going forward RISE will be focusing efforts on top 25 exchanges. The team will always be evaluating new and innovative exchanges as they come up. Cormac and Steve are the co-founders of RISE. Essentially, they conduct three key areas of the business: legal, finances and exchanges. The technology lead is Andrea and our incredible development team, who based on their expertise make decisions to ensure we are building the best technology possible for RISE. The allocation of resources and operations are handled by Anjalee. MJ DeMarco was brought in to share his expertise in entrepreneurship with projects built on RISE. As we are currently focusing on the core technology, MJ’s advisory role will become more prominent at a later stage. So to conclude, yes Cormac is still working on RISE, but his role is less on the front line. As stated previously for Interlet, the white paper, pre-ann website, first snapshot and product designs were already worked on. Development is not in progress at this present time. RISE initially planned to build our core blockchain technology in parallel however, we now have decided to focus entirely on core blockchain platform first. With regards to the online casino project, there are many regulations associated with the concept of online casinos and this could hinder the entire project. Once core technology is completed, we will review the regulatory environment at that point in time. 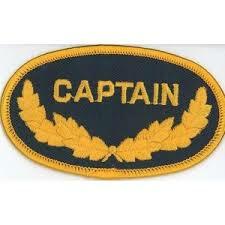 Please note that for RISE to be successful in the long run, we must remain compliant in all activities going forward. As stated in the previous answer, all projects are on hold. With regards to the online casino project, there are many regulations associated with the concept of online casinos and this could hinder the entire project. Once core technology is completed, we will review the regulatory environment at that point in time. As previously explained, RISE will be focusing on the core technology at this current point in time and this should be the ‘selling point’. Yes, in the short term it has impacted the two projects scheduled for release this year. However, we see immense value in focusing on the core platform now to ensure DAPP creation on RISE is accelerated in the longer term. For Interlet, please see earlier answer. To further clarify, Interlet was an ‘in-house’ DAPP that RISE initially planned to launch to showcase the RISE blockchain. At present we cannot give an answer on this as it will be reviewed once the core technology is completed. With regards to developers using RISE, we will be exploring different ways to attract and engage developers going forward. We will be leveraging a bounty program in the near future to drive contributions to RISE. Thank you for submitting your questions and we look forward to more great questions from the community. We understand the desire from the community for a live AMA and will aim to do this for early June. 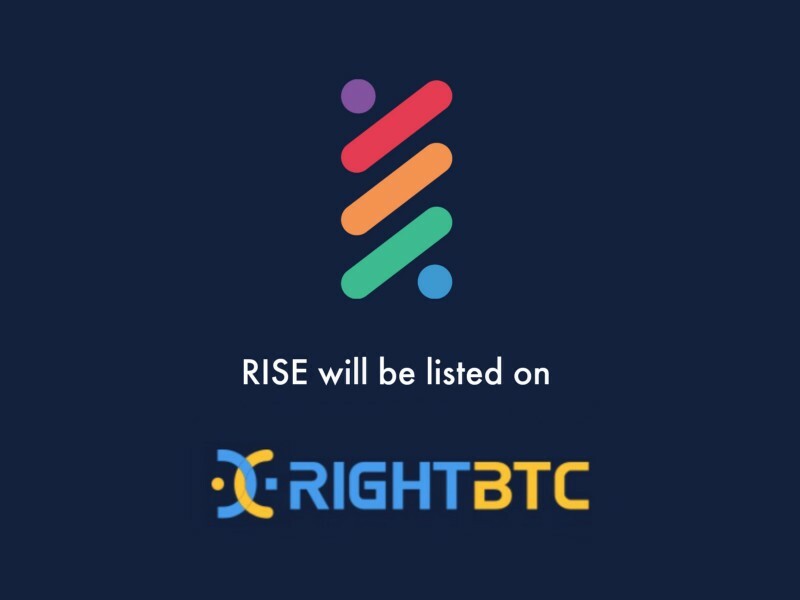 We are incredibly excited to announce that RISE will be available on RightBTC on 26th June 2018 with trading beginning on the 27th June 2018. RightBTC is a leading global digital assets management platform based in Dubai UAE. RightBTC has a strong loyal user base and plans to expand users rapidly both on their existing exchange and Tulipex, a new exchange which RISE will also be listed on in the future. RightBTC is available in English and Chinese. RightBTC makes use of technological advantages to continuously optimise their operational procedures, thus guaranteeing the stability and safety of their trading system and ensuring users can deposit, withdraw, and make transactions quickly and safely. RightBTC guarantees the safety of user information, and ensures user data will not be tampered with or stolen. RightBTC store users’ digital assets in offline environments by using a cold wallet to guarantee the safety of capital. RightBTC have servers in several data centers and have adopted distributed cluster technology to optimize load balancing and ensure the stability of the platform. With RISE Mainnet live since April, we believe the RightBTC user base and their future growth plans align with the aim of diversifying the RISE DPOS blockchain offering all over the world. RISE Vision (token symbol RISE) is an ecosystem for developers, offering a platform for the development of decentralised applications powered by a community driven Delegated Proof of Stake (DPoS) blockchain. The RISE DPoS network is in mainnet and only 101 elected Delegates are given the authority to be block producers. Delegates are elected by the RISE community who cast their votes by staking and voting with their RISE wallets. The vote weight of each wallet is in proportion to the amount of RISE it contains. In this newsletter, we will give a roundup of what RISE has been up to in the month of August. To start off, we have a great new video explaining RISE technology and the future we are aiming to build. Please feel free to comment, like and share to help us expand the community. The Future on RISE — Video in collaboration with Darkroom Ltd. Earlier in August, we announced that RISE Core 1.1.1 released to mainnet. This latest release came with significant enhancements to security, data integrity and a transaction throughput of 1000 TPS. This new release is available for download here with instructions on how to update your RISE node. For those interested to read a very detailed update on the new updates and how these were achieved you can read the RISE Core 1.1.1 — Technical Overview here. RISE 1.1.1 required 278 commits, 265 file changes, more than 23,000 lines added along with 11,000 removed. You can see the full changelog here. Node operators and Delegates should update their nodes as soon as possible following all releases and updates. This news was picked up by CryptoNinjas and can be read in this article: ‘RISE v1.1.1 of DPOS blockchain technology makes significant advancements’. 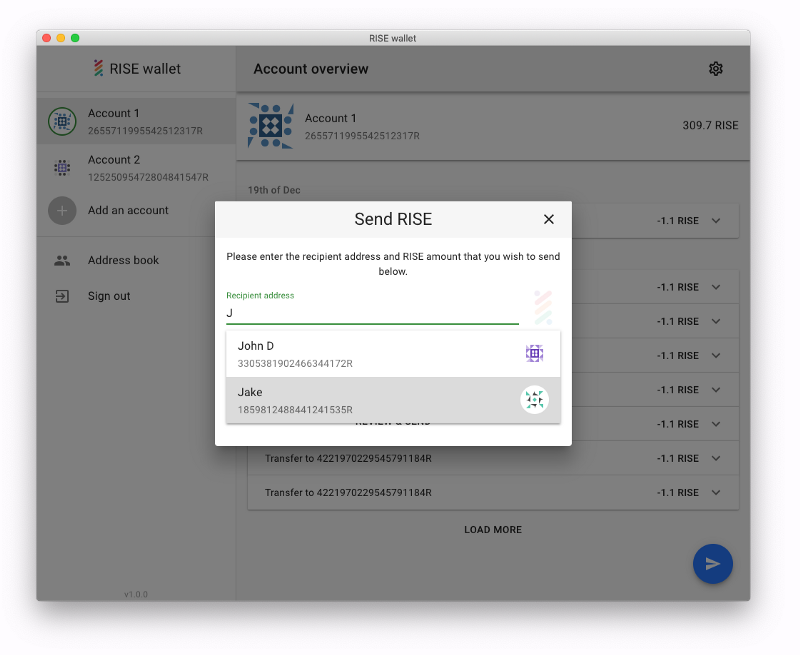 In August, we released an update on how the new RISE wallets are going to change the sign-in flow to protect users RISE even more than before. Do you want to help us make a great wallet? You can still sign up as a tester for future testing by filling out this form. Mart and Tobias have been continuously refactoring code and refining key usability elements of the new RISE web wallet. Together, in August they pushed 134 commits to master and 138 commits to all branches. On master, 90 files have changed and there have been 7,372 additions and 2,731 deletions. As part of our efforts to increase awareness of the RISE project and communication with the community we hosted our first Reddit AMA in August. You are able to read the August AMA on Reddit here. 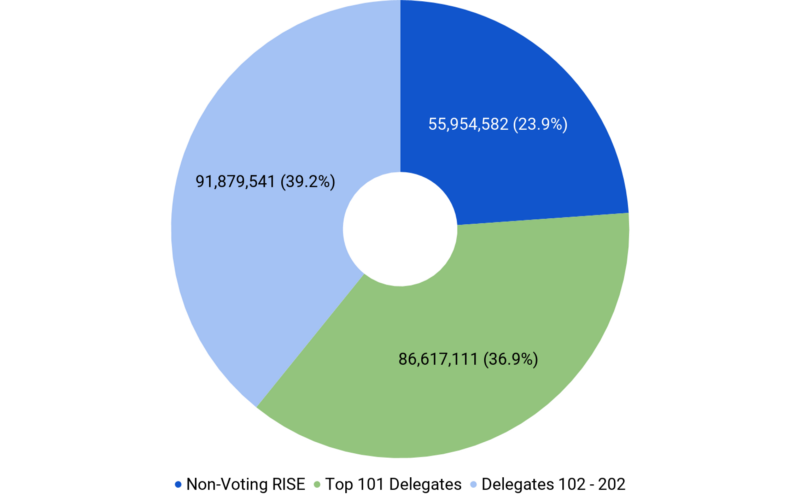 The below chart highlights 74.74% of RISE (96,007,205) voted to elect the 101 Delegates and 2.36% of RISE (3,035,217) on 101 to 202 Delegates securing the network. 22.89% of RISE (29,406,582) is non-voting. Total RISE Supply 128,449,004. Chart generated 2nd September 2018. In this newsletter, we will give a roundup of what RISE has been up to in the month of October. RISE Core version 1.2.0 featuring ProtoBuf network layer and many other improvements has been released to mainnet. Read about the release in Github here — RISE v1.2.0 — Mainnet. On the RISE node there have been 20 commits to development and 32 commits to all branches. On development, 63 files have changed and there have been 2,905 additions and 1,514 deletions. The vote weight of each delegate will be recalculated based on productivity. Delegates who miss multiple blocks will have their vote weight reduced progressively, depending on their productivity. For example, if vote weight is 100 and productivity is 70%, the recalculated weight will be 70. They will lose ranking and may even exit the pool of possible forgers if productivity is very low. The 101 forgers of each round will be picked from a larger “pool” of possible forgers, not only the top 101 sorted by recalculated vote weight, but from a larger subset of delegates (the size of the pool is yet to be determined) and their probability to forge is randomised but still dependent on their votes weight. Higher votes weight still means proportionally higher probability to forge, but does not give the full certainty for each round. During the month of October, there has been great progress on the new web wallet. The RISE wallet now has an address book and support for contacts. This month, unit tests (besides end-to-end tests) were carried out and many more small bug fixes and optimisations. The team have also been preparing for the public beta release, more details will come in the next few weeks. On the RISE Wallet repository there have been 110 commits pushed to master and 125 commits to all branches. On master, 81 files have changed and there have been 8,956 additions and 2,192 deletions. This month RISE was integrated into IOV core repository in Github. IOV aims to provide a universal protocol for blockchains and wallet users. RISE is looking forward to being part of an interoperable ecosystem. The new version of IOV-Core — version 0.7.0 — enables cross-chain transactions with RISE. Andrea collaborated in the project by contributing a library to IOV-Core. One of our community members, Vergill Lemmert, has created a brand new app — the RISE browser extension! 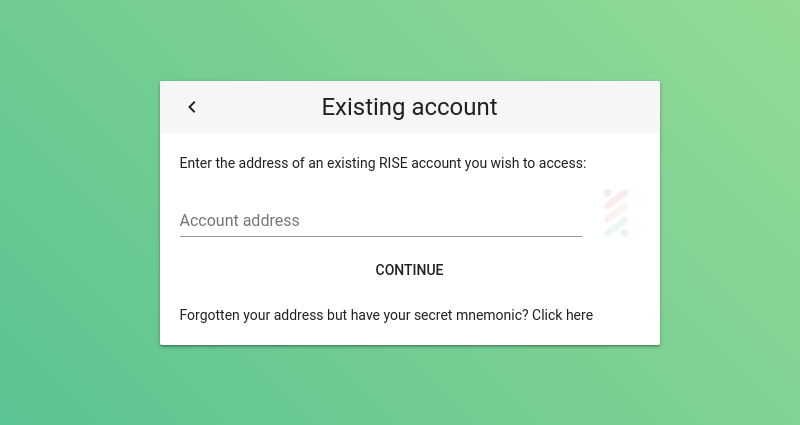 It is a notification app that allows you to follow RISE addresses in near real time. Vergill has also written a blog post to set up and customize the extension. 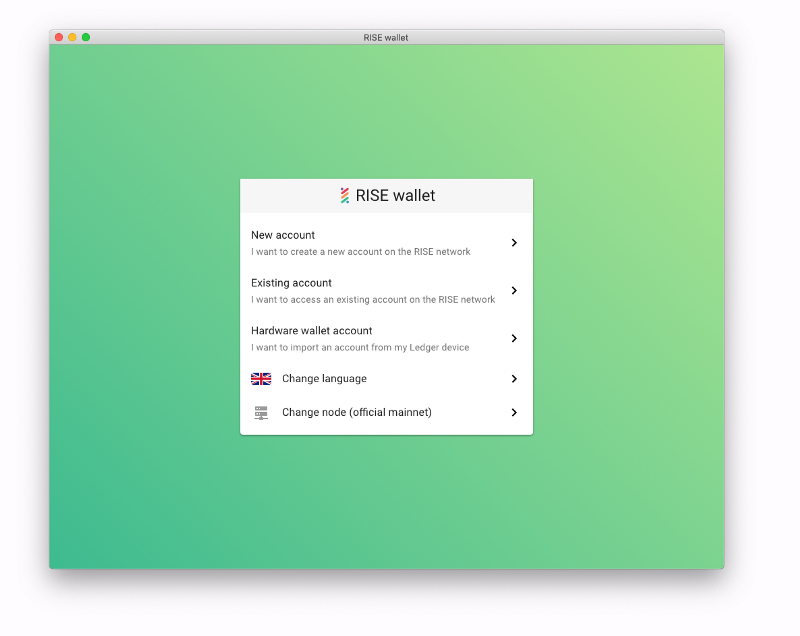 After over half a year of active development, we’re pleased to announce RISE Wallet 1.0 being available on the web and for desktops. We wanted to make a secure, easy to use and modern wallet which would work seamlessly across all platforms. To achieve this, we used TypeScript (the same language the RISE blockchain is written in) along with React and Material-UI. This article will walk you through the the new features, as the new version brings many new features. 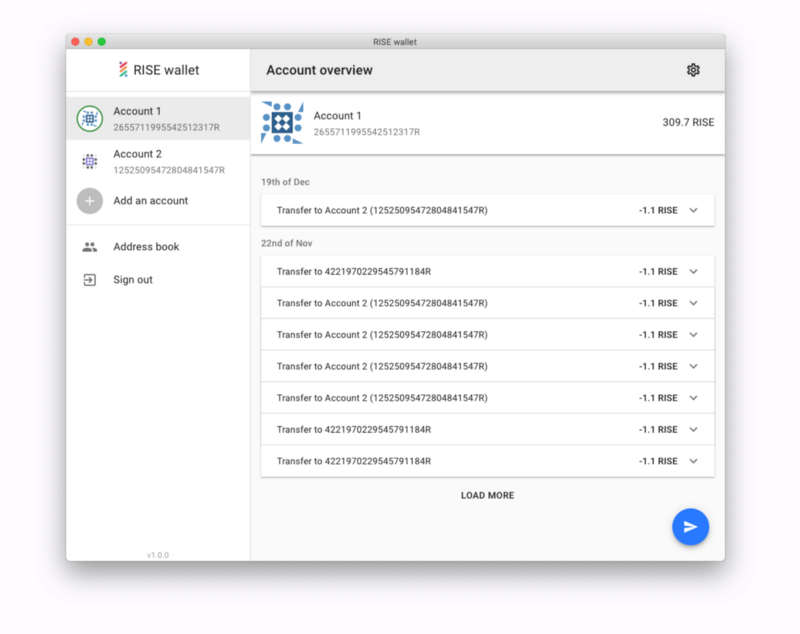 Redesigned with accessibility in mind and taking advantage of Google’s battle tested Material-UI components, the new wallet have a familiar look and it’s easy to use. One of the biggest new features is support for multiple accounts. You can add as many as you wish and then customize the order by using names and pinning. Mart has already discussed the new sign in flow in details a while back. In a nutshell, we won’t ask for your secret mnemonic or the passphrase until the last moment, when it’s actually required. This reduces the risk of having it leaked. 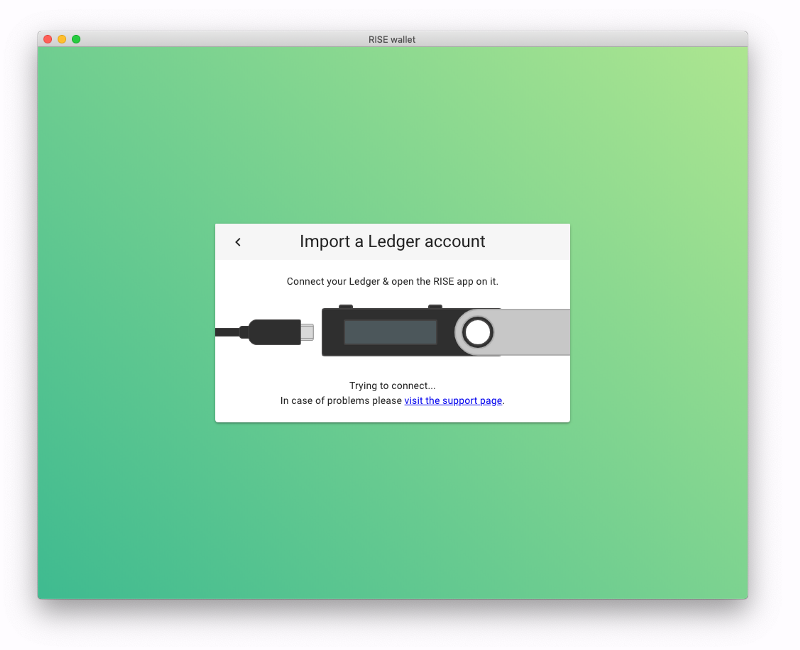 You can now use your wallet for the Ledger Nano S hardware wallet allowing to import and sign transactions for the accounts stored on the device. This feature requires Google Chrome or a desktop version. Responsive design and carefully crafted password forms will let you easily send new transactions from your phone, while making use of your device’s secure keychain. The following video shows using Touch ID to sign a transaction with both the mnemonic and the second passphrase. 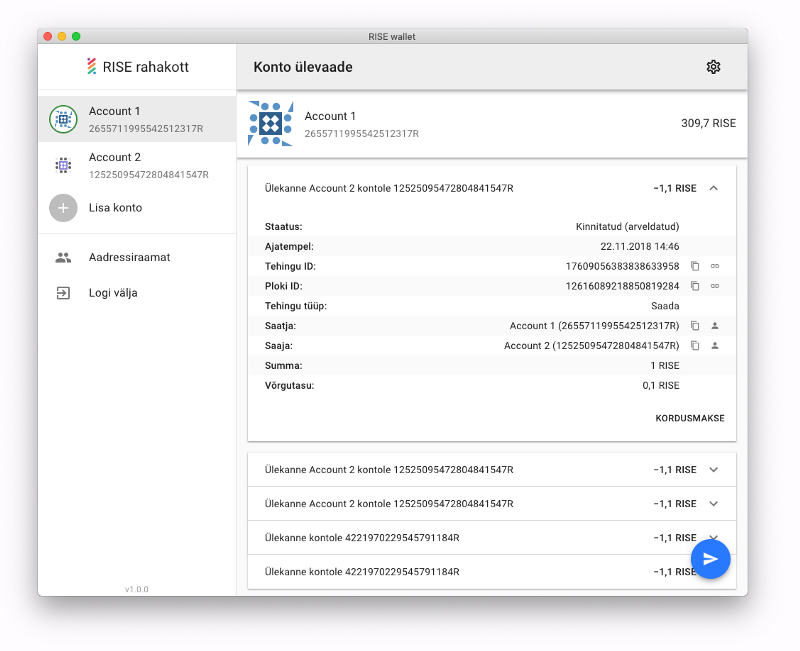 To bring another level of security, you can download RISE Wallet as a desktop app for MacOS, Windows and Linux. Below is a screenshot on Win10. Downloadable binaries can be found on the project’s GitHub release page. We’re looking into translating the app to other languages through a CrowdIn campaign. At the time of writing this, only English and Estonian languages are complete. If you would like to participate for your own language, become a translation contributor. You can now assign names to frequent contacts and then quickly fill the Send RISE form, even by using only your keyboard (SHIFT+S). Contact names also appear in transaction details. Important thing to note, that data is being persisted only on your local machine. Last but not least, switching between networks (testnet / mainnet) is now much easier, being available at all times via Add an account -> Change node . 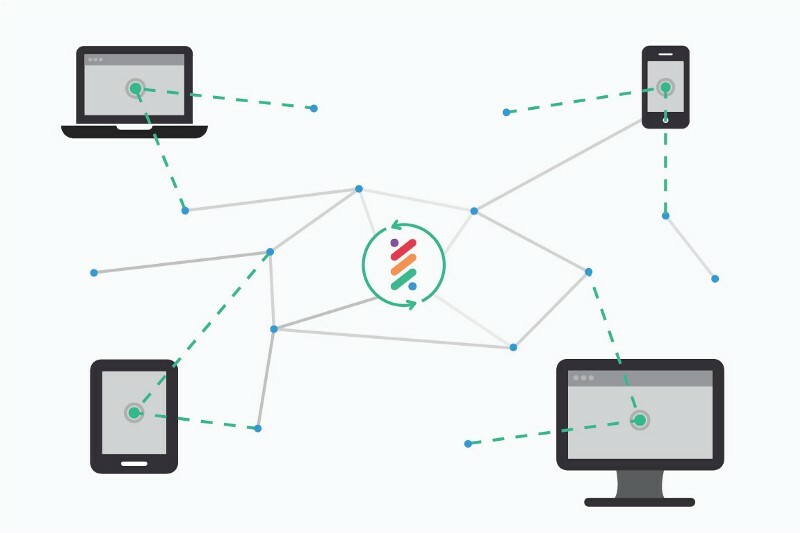 You can also connect to your own network of choice, if that’s your use case. RISE Wallet 1.0 is available to download today from project’s GitHub release page. 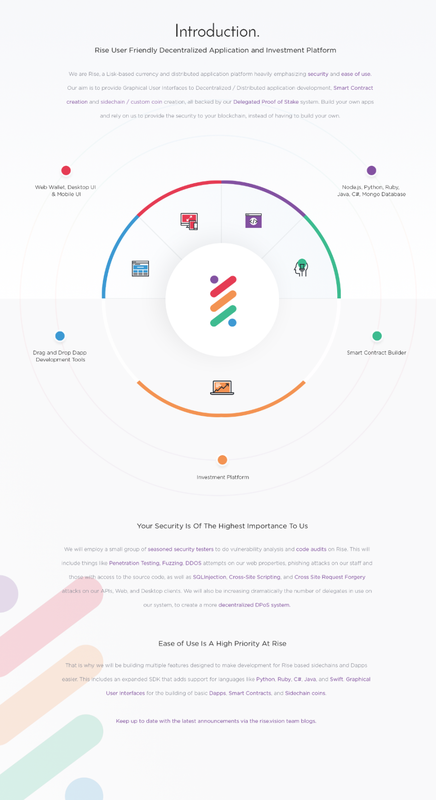 Please report any issues on the issue tracker or on the dedicated Slack channel.